Evidence-based studies have identified WMSDs as the most expensive occupational health disorder in the workplace and the leading work-related health concern, in developed as well as developing countries, accounting for over 30% of all injuries requiring time away from work. The International Labour Organization estimates that the cost of work-related ill-health incidents and accidents amounts to 4% of the world's gross domestic product (GDP) (USD 1.25 trillion). According to the National Research Council and the Institute of Medicine, the total cost associated with reported WMSDs is high as USD 45–54 000 million (~0.8% of the USA's GDP). Previous epidemiological studies have shown considerable differences in the prevalence between countries. A survey in Greece recorded a 46%–47% prevalence rate. In the UK, the prevalence stood at 9%–11%, and in Australia, it was recorded as 41.7% of all injuries. Data on WMSDs in Nigeria are still dearth. Again, variations in trade, working environment, and existing ergonomics policies aimed at reducing WMSDs within the workplace contribute to the variations in the prevalence of WMSDs across countries. Specific physical factors which may include intense, rapid, awkward movement of body parts (e.g., bending, straightening, griping, holding, twisting, clenching, and outstretching of hands and arms) like those seen in load carriers are likely to show a high prevalence of WMSD. However, until an actual value is identified, load carriers may continue to suffer from the adverse effect of WMSD. In Nigeria, there are presently issues of economic recession and many people are struggling to get any kind of job to make money for self-keep and the family. Little or no attention is given to the risk of developing WMSDs neither are there data to substantiate the burden of this disorder in the region. 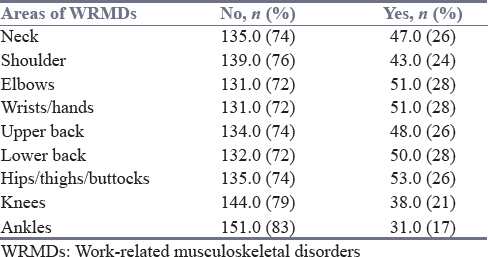 Studies on the association between demographic characteristics, job duration, and musculoskeletal disorders among load carriers in Kano metropolis are still sparse. It is, therefore, imperative and relevant to identify the prevalence and pattern of WMSDs to help tackle this menace by educating and enlightening load carriers on proper lifting techniques and maximum load to be carried in relation to body weight. This study was a cross-sectional design survey with the population drawn from load carriers in Kwari, Sabon-gari, and Singa markets of Kano metropolis. Individuals are included in the study if they have been carrying load on their heads, shoulders, or backs and have been carrying the load for 1 year and above. Load carriers that cannot read/comprehend Hausa or English language. Standardized Nordic Musculoskeletal questionnaire for the analysis of musculoskeletal symptoms in an ergonomic or occupational health context was used in the study. The validity and reliability of the questionnaires has been shown to be acceptable. Ethical clearance was sought and obtained from the Aminu Kano Teaching Hospital Ethical Committee. Signed informed consent was obtained from all respondents prior to the commencement of the study. Two hundred copies of the questionnaire were administered. However, 182 questionnaires were returned. Respondents were reached at their respective places of work and data were collected during their rest periods. Demographic data, assessment of MSD pattern, as well as MSD prevalence of the participants were done using descriptive statistics of frequency and percentage. 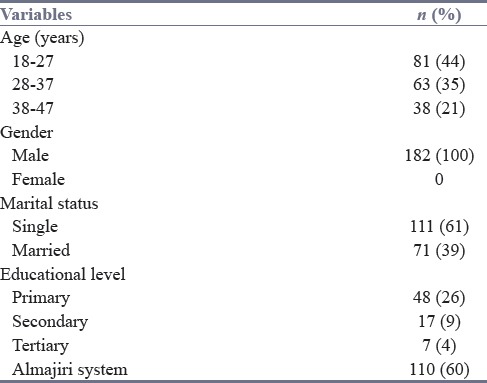 Sociodemographic characteristics of participants are presented in [Table 1]. Majority of the participants are adults with an age range of 18–47 years and they were all males. Over 60% of the load carriers are still single as the point of data collection. Majority of the respondents (82%) showed that they only attended primary school or the “Almajiri system” – traditional Quranic learning system incorporated with street begging. [Table 2] shows the total number of symptoms and pain reported at different body parts in the last 12 months. Upper and lower back disorders had the highest frequency, i.e., almost 70% of load carriers reported disorders in their back. This is followed by neck disorder which accounted for 59% of MSD among the load carriers. Respondents indicated 38%, 34%, 28%, and 25% for ankles, hips, shoulder, and knees, respectively. The elbow was the least (18%) reported MSD among the load carriers. [Table 3] shows the total number of symptoms reported at different body parts in the last 7 days. The neck, shoulders, lower back, and buttocks had the highest prevalence with each having about 30% or more. Other parts of the body such as the wrist/hand, knees, and ankle presented with about 20%–25% of affectation. [Table 4] shows the number of participants who were being prevented from carrying out normal activities due to MSDs in the last 12 months. The neck, elbows, wrist/hands, upper and lower back, as well as the buttocks/hips had almost equal percentage of presentation ranging from 26% to 28% that prevented respondents from carrying out their activities of daily living (ADLs). The least part of the body with MSD was found to be the shoulders, knees, and ankles, accounting for almost 20%–24% of participants acknowledging that they were prevented from their ADLs. This study investigated the pattern of MSDs among load carriers in Kano metropolis. The response rate was 90%. This study showed that all of the respondents were males, indicating that only males are involved in load-carrying jobs in Kano. The result of the present study is in contrast to that of Maduagwu et al. which showed a male-to-female ratio of 60:40 involved in load carrying in the Southern Nigeria, indicating no cultural or religious restriction in the type of job women do in the southern part of Nigeria. Almost 80% of respondents are within the ages of 18–37 years. Young people are generally perceived to be more active than older ones and perhaps might be likely susceptible to having MSDs even outside the work environment and could be responsible for this higher prevalence of MSDs in the young age group. With regard to patterns of MSDs, most of the participants reported upper and lower back pain with 71% and 61%, respectively. This is followed by the neck accounting for almost 60%. This pattern is a clear indication that the most vulnerable part of our body to be affected due to heavy and poor lifting technique is the spine. De Beeck and Herman reported that work-related low back pain and injuries are the most common MSDs caused by manual handling. About a fourth of European workers suffer from back pain, which tops the list of all reported work-related disorders. They further stated that factors that increase the risk of injury to the back include the load being too heavy, large, difficult to grasp or unstable; the task being too strenuous or involving awkward postures or movements; and the working environment lacking sufficient space, having slippery, uneven or unstable floors, and having extreme temperatures or poor lighting. These are all present in load carriers in Kano, making them very vulnerable to injuries to the spine. Pain, stiffness, and other limitations imposed by MSD can make even simple household tasks and everyday activities a formidable challenge. This study showed that there are about 17%–30% of load carriers who were being prevented from their ADLs due to MSD. It is, therefore, imperative that MSDs among load carriers will impose greater loss in income as well increased health-care cost and reduced quality of life. Bernajee et al. in their study affirmed that as there is considerable impact on quality of life of people with MSD due to limitations in ADL, the aim of any long-term management of MSD should be to improve the quality of life of the affected people. The elbow and hand accounted for the least percentage (18%–20%) of body part injured during the last 12 months of load carrying. This is likely due to the fact that the elbow and the hand are not involved in repetitive movement during load carrying. There is also less likelihood for nerve compression injury during load lifting, which may be the reason for low prevalence of elbow and hand injury. This study has, therefore, provided information on the pattern of MSD on load carriers that can help design health promotion programs that will educate and enlighten load carriers the need to reduce WMSDs. It also provided data for policymaking on WMSD. There is high prevalence of MSDs among load carriers within Kano metropolis, with majority of the participants suffering from pain/discomfort in the upper and lower back and neck region, which may be due to unawareness of proper manual handling. It was, therefore, recommended that awareness campaign to educate and enlighten load carriers on proper lifting technique and load carrying should be organized. Macdonald W. Department of Employment and Workplace Relations. Available from: http://www.ag.gov.au/cca. [Last accessed on 2018 Mar 23]. Tinubu BM, Mbada CE, Oyeyemi AL, Fabunmi AA. Work-related musculoskeletal disorders among nurses in Ibadan, South-West Nigeria: A cross-sectional survey. BMC Musculoskelet Disord 2010;11:12. Schierhout GH, Meyers JE, Bridger RS. Work related musculoskeletal disorders and ergonomic stressors in the South African workforce. Occup Environ Med 1995;52:46-50. Punnett L, Wegman DH. 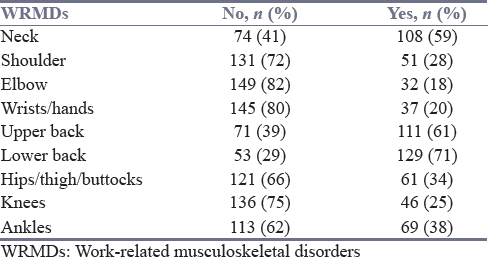 Work-related musculoskeletal disorders: The epidemiologic evidence and the debate. J Electromyogr Kinesiol 2004;14:13-23. Picavet HS, Hoeymans N. Health related quality of life in multiple musculoskeletal diseases: SF-36 and EQ-5D in the DMC3 study. Ann Rheum Dis 2004;63:723-9. Baldwin ML. Reducing the costs of work-related musculoskeletal disorders: Targeting strategies to chronic disability cases. J Electromyogr Kinesiol 2004;14:33-41. Fourth European Working Conditions Survey. Available from: http://www.newunionism.net/library/workinglife/Eurofound-EuropeanWorkingConditionsSurvey-2007.pdf. [Last accessed on 2018 Mar 22]. Maduagwu S, Maijindadi RD, Duniya KI, Oyeyemi AA, Saidu IA, Aremu BJ. Prevalence and Patterns of Work-related Musculoskeletal Disorders among Bankers in Maiduguri, Northeast Nigeria. Occup Med Heal Aff 2014;2:1-6. doi:10.4172/2329-6879.1000169. De Beeck RO, Hermans HV. Research on Work-Related Low Back Disorders. Brussels; 2000. https://osha.europa.eu/en/tools-and-publications/publications/reports/204. [Last accessed on 2018 May 05]. Banerjee A, Jadhav S, Bhawalkar J. Limitations of activities in patients with musculoskeletal disorders. Ann Med Health Sci Res 2012;2:5-9.